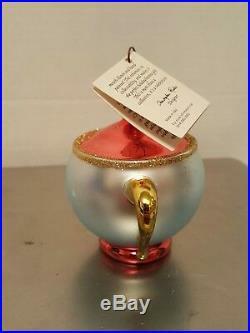 CHRISTOPHER RADKO TEA & SYMPATHY Christmas Ornament Beauty & the Beast. The item “CHRISTOPHER RADKO TEA & SYMPATHY Christmas Ornament Beauty & the Beast” is in sale since Tuesday, February 5, 2019. This item is in the category “Collectibles\Decorative Collectibles\Decorative Collectible Brands\Christopher Radko”. 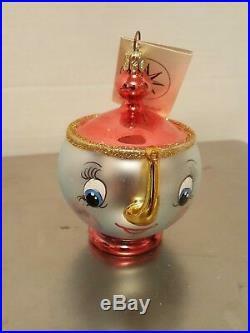 The seller is “disney_collector30″ and is located in North Sioux City, South Dakota. This item can be shipped to United States, Canada, United Kingdom, Denmark, Romania, Slovakia, Bulgaria, Czech republic, Finland, Hungary, Latvia, Lithuania, Malta, Estonia, Australia, Greece, Portugal, Cyprus, Slovenia, Japan, China, Sweden, South Korea, Indonesia, Taiwan, Thailand, Belgium, France, Hong Kong, Ireland, Netherlands, Poland, Spain, Italy, Germany, Austria, Bahamas, Mexico, New Zealand, Singapore, Switzerland, Norway, Ukraine, Croatia, Malaysia, Chile, Colombia, Costa rica, Dominican republic, Panama, Trinidad and tobago, Guatemala, El salvador, Honduras, Jamaica, Antigua and barbuda, Aruba, Belize, Dominica, Grenada, Saint kitts and nevis, Saint lucia, Montserrat, Turks and caicos islands, Barbados, Bangladesh, Bermuda, Brunei darussalam, Bolivia, Egypt, French guiana, Guernsey, Gibraltar, Guadeloupe, Iceland, Jersey, Cambodia, Cayman islands, Liechtenstein, Sri lanka, Luxembourg, Monaco, Macao, Martinique, Maldives, Nicaragua, Pakistan, Paraguay, Reunion, Uruguay.